New Halloween Movie Begins Shooting in Original Haddonfield Location? UPDATE: Bloody Disgusting is now claiming that the photos seen below are actually from the production start of FX's hit horror series American Horror Story Season 8. Which are interesting in their own right. The next season of AHS is said to revolve around the recent presidential election. 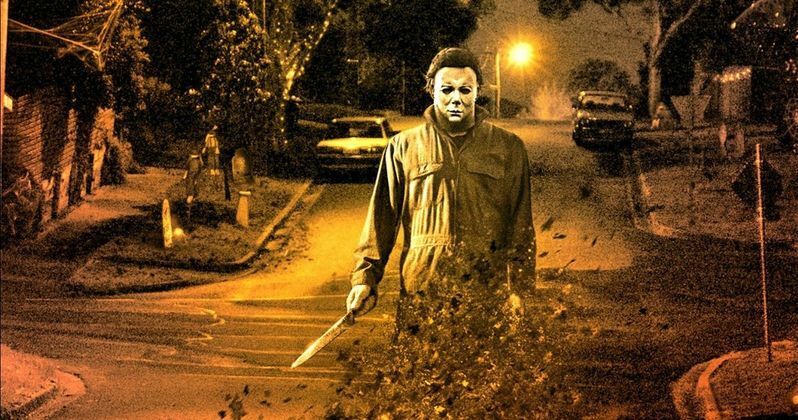 So why is the show heading to Michael Myers' home town? Guess we'll have to wait until fall to find out. ORIGINAL STORY: New pictures indicate that filming may have already started on David Gordon Green and Danny McBride's Halloween movie. It had been previously reported that the movie was shooting this fall, but new images leaked on social media have shed light on the upcoming project. Green and McBride have been relatively silent about their take on the Halloween franchise, and fans of the original movies have been left scratching their heads about the duo behind Eastbound and Down tinkering with the horror classic. Some news on the production of Halloween Returns comes courtesy of Bloody Disgusting, where they are reporting that some retrofitting has been done to the original homes from the movies. The neighborhood is located in the city of Pasadena, aka the fictional Haddonfield in the movie. And it is a popular tourist attraction for horror fans from all over the world. John Carpenter super fan Steve Piacenza snapped some pictures from the location over the weekend and spoke to Bloody Disgusting about his discovery. Piacenza says that he had been watching the area for a couple of nights and he noticed that they emptied the 2 original homes that were used in Carpenter's original 1978 movie. After the homes were emptied, the sets were taken back to look like the 1978 versions of the homes. Piacenza said that he talked to a few people from the crew who were able to confirm that "it's definitely Halloween." The movie is scheduled for fall of 2018 and it was originally thought that production would start in the fall of 2017, but it appears that production has already started. Piacenza went into some more detail about the neighborhood and the activity. He explains. "The entire block was blocked off and the entire neighborhood was sprayed with frost. The babysitter house/the Wallace house. And the murder house/Annie's house. In the two featured homes, they emptied out home furnishings and put in the retro furniture. Friday night they filmed an ice cream truck with a mother and son walking across the street before disappearing behind the house. A loud scream [was heard]. Huge production. They filmed Thursday and Friday." Piacenza was not able to confirm whether the production was a setup for a teaser or for the movie, but regardless, something is happening and it's starting to get interesting. McBride and Gordon hadn't revealed what time period they would be utilizing, so maybe it will take place after the events of the first movie? Or maybe the teaser will revisit the original movie. It's too early to tell. It seems that McBride and Gordon are set to try and return Halloween back to the basics without any supernatural aspects, which has lead to mixed feelings from fans. McBride has previously talked about wanting to take Michael Myers back to reality to get people scared about events that can actually happen. Their take on Halloween will open on October 19th, 2018, but until then you can check out Piacenza's pictures below.